I know there is no such thing as Best South Florida Wedding Photographers.. but, if there is in your mind, then I am one of them! My bride here (Danielle) who had a beautiful home based wedding, had just finished with the “getting ready” and we were moments before the ceremony and I took this shot. 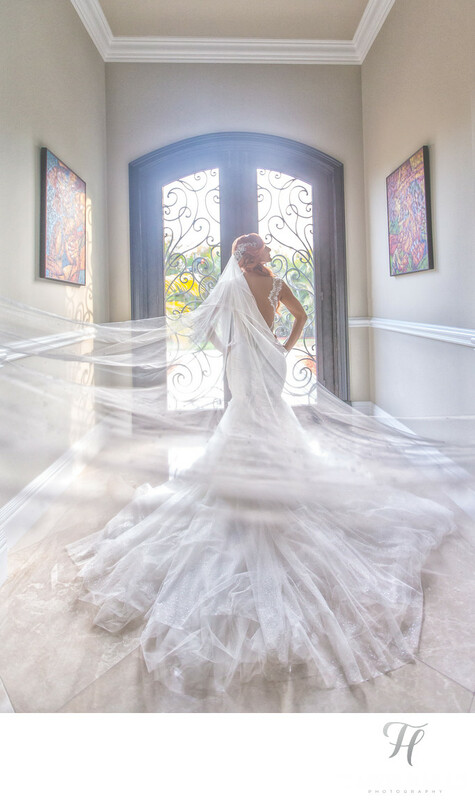 I used the strong back light of the window / door to fill the room with light, and I then shaped her dress by posing her legs under (to give shape) my assistant “fluffed” the bottom of the dress, and I held the veil in my hand while I snapped away. What I like about it, is that everything was very balanced in the frame. The pictures on the wall, the crown molding, the door, etc. all were very symmetrical. In fact, because of this situation it made getting the shot very annoying. It had to be perfect, and I am sure it's not.. but it's close enough for me. I really love it when we get to go and shoot in the clients house. I actually prefer this over any hotel, because each house is TOTALLY different, and the hotel.. well.. it's always the same old thing over and over again. Nothing really wrong with that, but let's face it.. there often are more creative ideas in a new place, then an old place. This is just common sense.